This is the official web site of American saxophonist Jonathan Helton, soloist, chamber musician and Professor at the University of Florida. Thanks for visiting! I have been playing the saxophone for 40 years. My instrument has taken me all over the world—France, Belgium, United Kingdom, Switzerland, Greece, Czech Republic, Canada, China, Taiwan, Singapore, Japan, Thailand, Australia, Colombia, Argentina, Chile, Brazil, and to twenty of these United States. 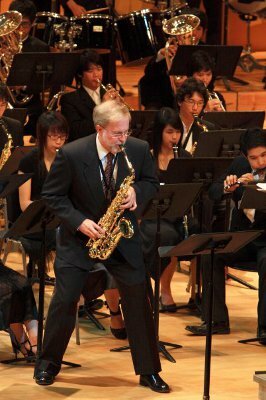 I have been teaching others to play the saxophone for over 30 years. My students have secured positions teaching in secondary schools, colleges and universities throughout the Unites States and Asia; they are active performing in professional chamber ensembles, for the Ringling Brothers Circus, and in the premiere U.S. military bands. I am looking forward to more travels and the chance to share my music and my tricks of the trade with wonderful students and audiences. Copyright 2011 Jonathan Helton. Powered by Blogger.